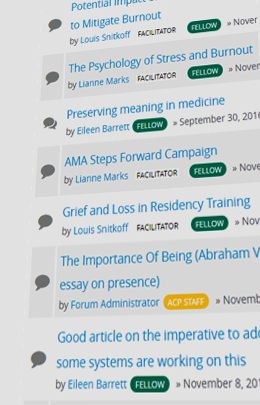 We’re happy to announce ACP Member Forums, formerly known as ACP Special Interest Groups. The new Member Forums are fully integrated into our current ACP Online platform, meaning you'll no longer need to use a different login. Any member logged into ACP Online will already be logged into the Member Forums on their initial visit. ACP Member Forums allow you to instantly participate in whichever discussions you wish - no need to "join" specific groups. You can also subscribe to alerts to receive daily email digests showing new posts and linking you directly back into the discussions.